The Seattle SeaChordsmen barbershop chorus staged a professional and entertaining musical production on Saturday at two performances in Shoreline. Charlies joins the Air Force and becomes a test pilot. "Songs of Childhood? Stories of A Lifetime" presented the story of Charlie, whose childhood dream was to be a military pilot. The songs and staging presented Charlie at different stages in his life as he never wavered from his goal. The SeaChordsmen have a robust performance and competition schedule. They appear regularly at Folklife, festivals, Mariners games, and stage several public performances a year in Shoreline. You can keep up with them on their Facebook page. I don't know if it's the mixture of grass seed in the Pridemore's back yard - or if it's the tiny neon sign that says "Good Eats" but they certainly get an interesting selection of wild critters. This pair, or some of their kin, were in the neighborhood at several times last year. Looks like they know a good thing when they see it. 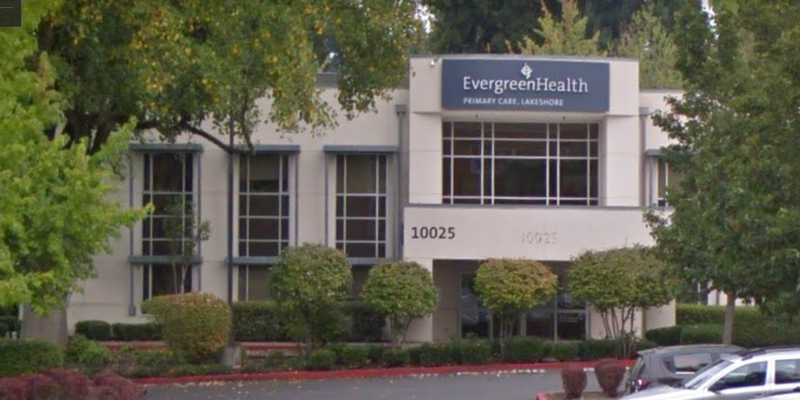 EvergreenHealth is pleased to announce that its Lakeshore Bothell primary care location has fully resumed operations and patient care. To ensure continued care for their patients, the providers and staff from EvergreenHealth Primary Care, Lakeshore Bothell temporarily moved their practices to the health system’s Lakeshore Totem Lake location following a flood in December, which required significant building repairs and construction. The practice partially reopened earlier this spring, on one of the two floors in its downtown Bothell facility and with approximately half of its providers. The remaining four providers resumed care at the Bothell location this week and welcomed all patients back to the Lakeshore Bothell practice. In mid-July, EvergreenHealth Primary Care, Lakeshore Bothell will offer appointments on Saturdays from 9am to 4pm in addition to its weekday hours of 8am to 6pm. EvergreenHealth Primary Care, Lakeshore Bothell is located at 10025 NE 186th Street in Bothell. Appointments and other inquiries online or call 425-486-9131. 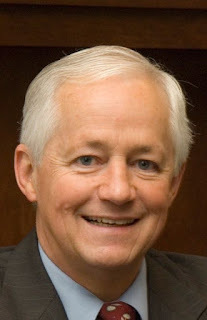 The National Court Reporters Association (NCRA), the country’s leading organization representing stenographic court reporters, captioners, and legal videographers, has announced that Douglas Armstrong has earned the nationally recognized Registered Professional Reporter (RPR) certification, having demonstrated his ability to produce a high-quality verbatim record. RPR certification distinguishes stenographic court reporters as being among the top contributors to the profession in terms of reporting skills, transcript production, reporting and operating practices, and professionalism. 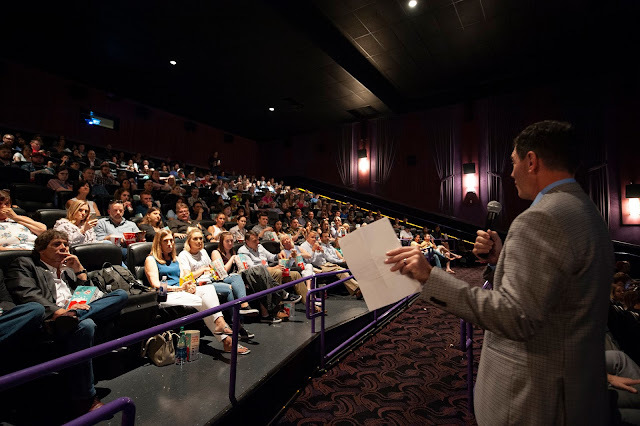 “Earning RPR credentials is quite an accomplishment given the amount of preparation and knowledge that successful candidates must possess to pass,” said Marcia Ferranto NCRA Executive Director and CEO. Armstrong is a member of NCRA and works as a freelance court reporter for Seattle Deposition Reporters. “I’m so fortunate to have found such a stimulating and rewarding career, and I’m proud to represent my profession and the NCRA with this hard-earned certification,” said Armstrong. The National Court Reporters Association (NCRA) has been internationally recognized for promoting excellence among those who capture and convert the spoken word to text for more than 100 years. Metro is switching to a new simple fare of $2.75 for all regular adult fare passengers starting on July 1, 2018. Metro’s new fare of $2.75 aims to make riding transit more convenient and avoid confusion over fare payment that leads to delays in boarding. A single fare for adult riders also lowers the potential for fare disputes, which will help improve safety. Metro’s fares for youth, seniors and disabled riders, and those enrolled in ORCA LIFT will not change. More information can be found on Metro’s fares page. Metro adopted a simple fare after receiving more than 11,000 responses to two public surveys, including one in which 80 percent expressed support for a flat fare. Metro previously had one of the nation’s most complex fare structures, with one zone for the City of Seattle and another for all areas outside of the city, as well as extra charges during the morning and evening commute. Metro’s simple fare also aligns more closely with other regional transit agencies, which do not have surcharges during peak hours. At the beginning of 2018, Metro increased funding for Human Services Tickets for riders with lower-income or no income. Metro also is working with ORCA agency partners to reduce the replacement card fee for ORCA LIFT customers from $5 to $3 and eliminate the $3 initial card fee for seniors and people with disabilities. Metro continues to evaluate ways to make fares easier to understand and pay. 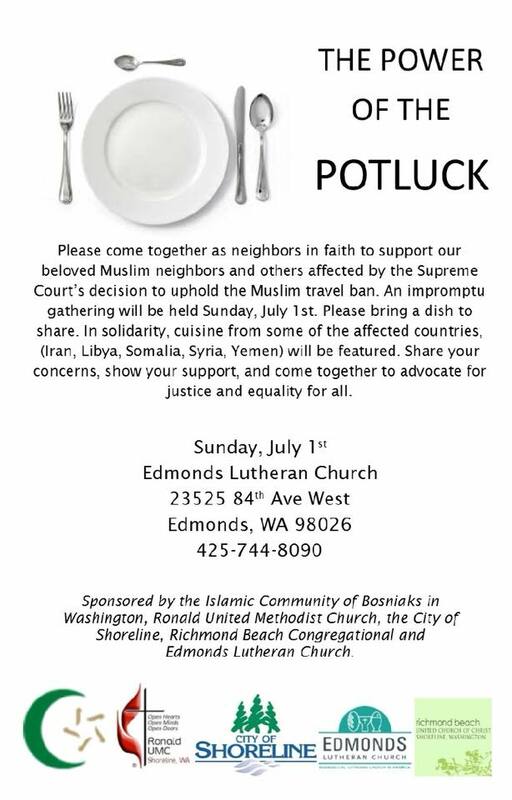 A potluck on Sunday, July 1, 2018 from 1 - 3pm at Edmonds Lutheran Church, 23525 84th Ave W, Edmonds 98026 will be held in support of local Muslims and other affected by the Travel Ban. Garlic scapes are a late spring-early summer treat. They're the tops of the fresh garlic plant, and they have the texture of green beans and the flavor of garlic. You can find them at farmers markets and sometimes in grocery stores but they'll be out of season soon, so get them while you can. The pointy top can be chewy, so trim it away. Heat the olive oil gently in a medium-size saucepan. Add the chopped garlic scapes and salt, and cook for 5 to 10 minutes, until the scapes are just tender. Add the summer squash and cook for 5 to 10 minutes longer, until the squash is tender. Add the lemon or vinegar, and serve. They are held on the first Monday of every month, 5:30 to 7pm. This month July 2, 2018. Monday night's menu is Smoked salmon pasta salad, summer squash with garlic scapes, chickpea and cucumber salad, green salad, and summer fruit. Insurance Commissioner Mike Kreidler disciplined and issued fines in May, totaling $172,900, against insurance companies, agents and brokers who violated state insurance regulations. A consumer filed a complaint with the insurance commissioner stating that Kaiser failed to notify him that he had five days to provide supporting information to an Independent Review Organization (IRO), one of consumers’ health insurance appeal rights. All but one consumer were not told of their right to provide additional information to the IRO within five business days. Kaiser failed to send files to the IRO within three business days. All but one of the expedited files took longer than 72 hours to complete. Half of the consumers who filed were not given the IRO name and contact information within one business day. The insurance commissioner suspended $30,000 of the fine as long as Kaiser complies with the terms of the compliance plan and doesn’t commit additional law violations within two years. 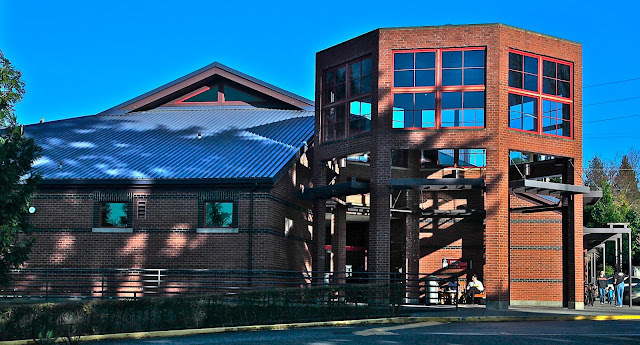 The Snohomish County Hearing Examiner has denied BSRE Point Wells LLC's (BSRE) request for an extension of the expiration date of its urban center development applications. The hearing examiner has also granted the Snohomish County Planning and Development Services Department's request to deny BSRE's applications without an environmental impact statement because the applications are in substantial conflict with the county code. "BSRE can appeal the decision to the County Council and through the Courts, but they will have to prove that the Hearing Examiner made an error in reviewing the facts of the case; that will be a difficult standard to meet. "BSRE could also submit a new application for a somewhat smaller Urban Village development, but that would require an agreement with both Shoreline and Woodway on how traffic and other impacts would be handled. 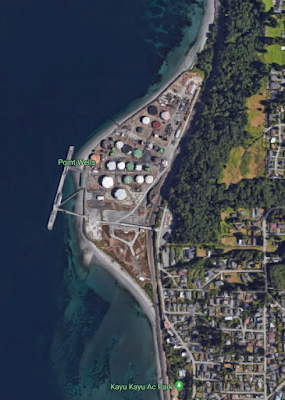 That agreement would be required before the application could be submitted, which gives both Shoreline and Woodway more control over the size of the development." Seattle Poppy identified this vibrant red flowered plant as Monarda (beebalm). She found it on 5th NE north of NE 170th. The Gardening Know How site says that this plant is very attractive to bees, butterflies, and hummingbirds. 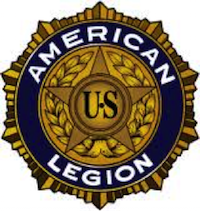 The American Legion Post 227 in Shoreline will host a Veterans Meet and Greet BBQ event during the hours of 12:00 noon to 3:00pm on Saturday, July 14, 2018. The event is open to all U.S. Military active duty personnel, all Veterans, Police and First Responders, their families and guests. Also, an invitation is extended to our expanding supporting community. The Post Auxiliary will participate as well, along with family and guests. Come and join us for burgers (including some vegans) and brats along with the “tasty” side dishes, salads and condiments. Let’s not forget the watermelon, soft drinks and bottle water to be served. A donation station will be set up to defray some of the costs. Please come during the “grilling hours” stated above. Bring family, friends and especially your veteran friends and enjoy the conversation and fellowship. We will again be treated to a concert of patriotic music and songs by the Ames family. The American Legion Post is located at 14521 17th Ave NE, Shoreline 98155. 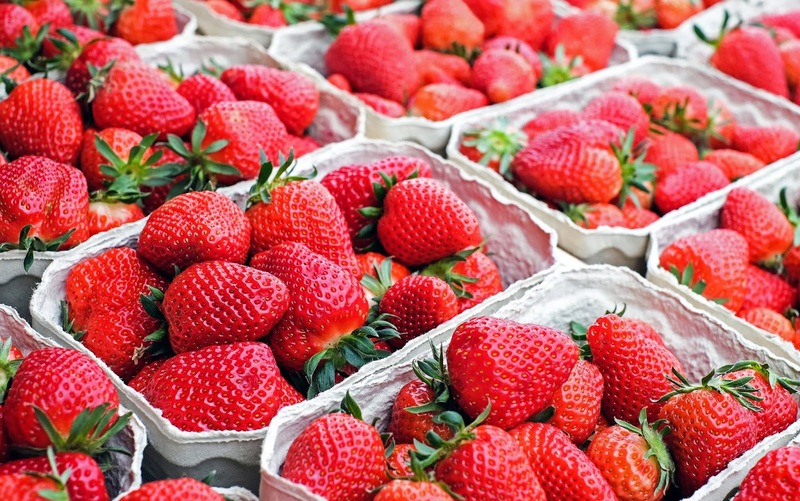 What's new at the Shoreline Farmers Market this week? Bring your appetite for New Orleans Soul Food from food truck, Where Ya At Matt. Looking for more? Kiss My Grits will return this week serving southern grits. You won't leave hungry that's for sure! Every week the generous vendors donate fresh produce to the Hopelink food bank. Hopelink will be tabling at the market this week so come by and learn more about how you can help your neighbors. The Market makes it easy for people on constrained incomes. They accept SFMNP, WIC, and EBT/SNAP. They participate in the Fresh Bucks Program, matching EBT/SNAP dollar for dollar. The Farmers Market is held on the upper level of Shoreline Place at N 155th and Westminster Way, by Central Market. Enjoy an amazing evening of multicultural music, dance, drumming, poetry, and song! 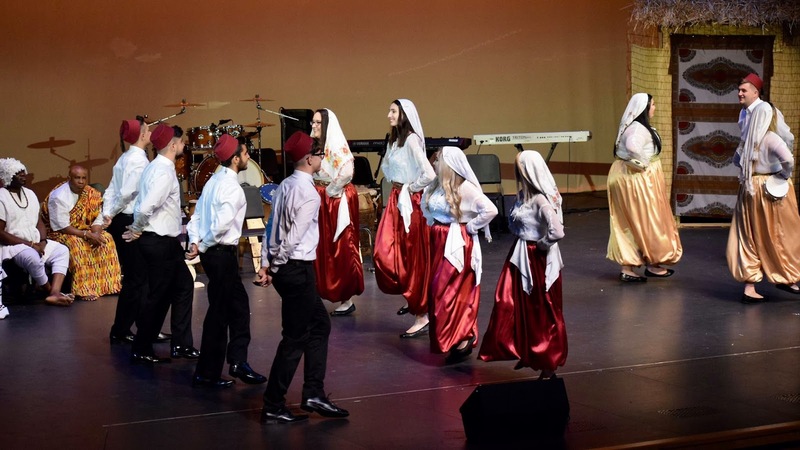 Performances by award winning Northside Step Team, Alchemy Tap Project, Will Rideout, Kud Ljilijan Bosnian Folk Dance, Saeeda Wright, Charles Armah, Yaw Amponsah, and more!! Tickets available online. $10 for students and $20 for general public. Make your summer count! 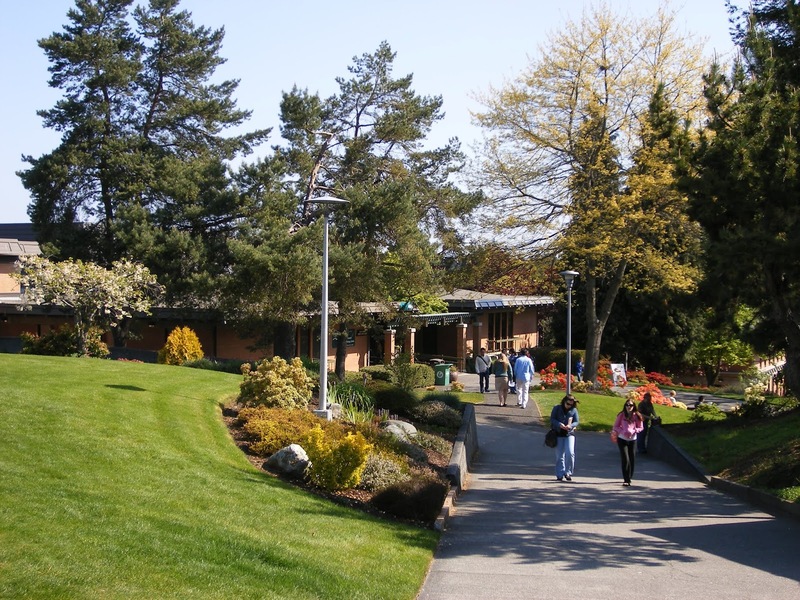 There's still time to get a jump on your educational goals with convenient, affordable classes at Shoreline Community College. Earn 1 to 15 credits in as little as 4-8 weeks. Financial aid, scholarships, and payment plans are available. The College is offering 8 week classes as well as 4-week “fast track” classes that begin throughout the summer. There are online classes in addition to on-campus courses. Gain a full quarter’s worth of credits in 3 or 4 weeks with Fast Track intensive classes. Choose from session I (July 2-26) or session II (July 30-August 23). Students can enroll anytime before the first class session. Check out the complete summer schedule or a sample below of the most popular 8-week summer classes (July 2-August 23). 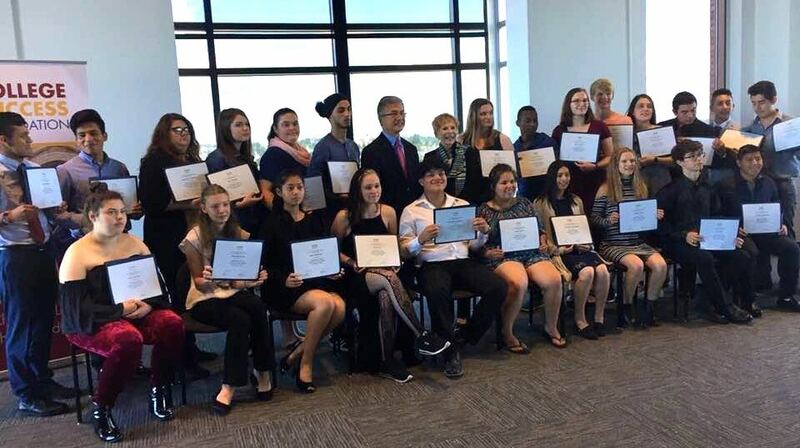 29 foster youth received the Washington State Governor’s Scholarship started by Governor Gary Locke. With the help of Treehouse and the College Success Foundation, these youth overcame many barriers to graduate from high school and be accepted into college. Congratulations and best wishes for their success! The next meeting of the Shoreline City Council will be held at 7:00 p.m. on Monday, July 16, 2018 at Shoreline City Hall. Janet Bartel of Arizona was the lucky winner of the Shoreline-Lake Forest Park Senior Center annual quilt raffle. We also thank the members of Thimble Belles for their wonderful display of quilts and sewing projects presented during the 2018 Shoreline Arts Festival and the donation of such a beautiful quilt for our raffle. All proceeds go to supporting programs at the Center. Calling all kids and teens 18 and younger! Nourish your body and brain while you read this summer. Grab a FREE lunch and take part in fun activities! Friday, June 29, 12:00 noon - 1:00pm at the Shoreline Library, 345 NE 175th, Shoreline 98155. This Friday, every kid in attendance at the Shoreline Library Summer Lunch will also get to choose a free book to keep, courtesy of the KCLS Foundation, in partnership with Hunger Intervention Program. 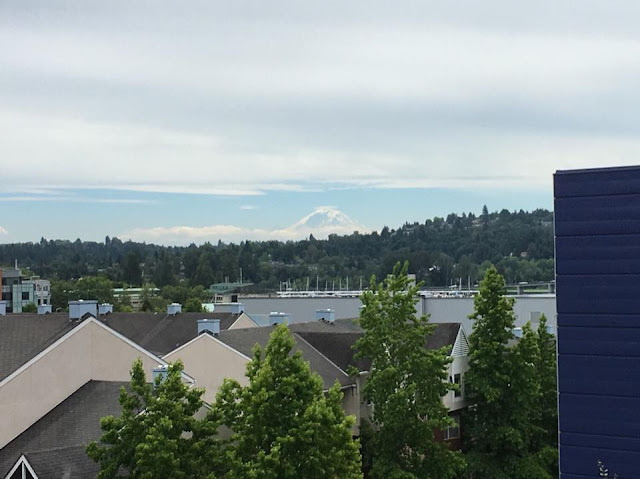 The Mountain was out on Wednesday afternoon. It hasn't been seen here for a long time, so it was a special treat. It had one of the flying saucer clouds floating on the peak. One of our claims to fame in the Northwest is that those clouds are said to be the origin of the whole aliens in flying saucers story. Reader Nikki Legas says they are Altocumulus Standing Lenticular Clouds. "they are associated with waves in the atmosphere that develop when relatively stable, fast moving air is forced up and over a topographic barrier that is oriented more or less perpendicular to the direction from which the upper-level wind is blowing. "This deflection creates a gravity wave downwind of the topographic barrier not unlike a wave you might generate by throwing a pebble into a pond. When sufficient moisture is present above mountain-top level, ACSL clouds develop within the crest of these mountain waves where the air is rising." Sad that one of the clearest views of The Mountain is from I-5. Rodney "Rod" Allen Falor 1940-2018 A celebration of life was held at the Shoreline Center for Rod Falor, who worked as a Personnel Director and Labor Arbitrator. "He was involved in many organizations, but most of all, Seattle Youth Soccer Association." In lieu of flowers, donations to the Shorelake Soccer club. William R. Forney M.D., USNR Ret. 1931-2018 Navy veteran, Richmond Beach pediatrician. See previous obituary. Maryann Mason Age 86 A funeral mass was said at St. Luke's for English teacher Maryann Mason. She taught for 46 years, then retired and went back into the classroom as a volunteer. She moved to Shoreline to live with her grandchildren. "To honor Maryann, please give a book to a child to provide the lifelong gift of reading." 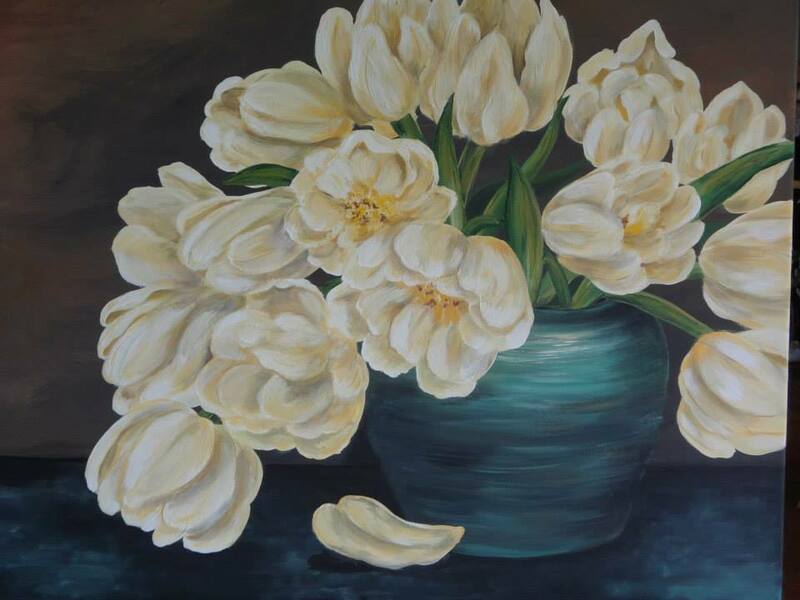 Gladys Pauline Mast 1920-2018 A founder of the Bellevue Arts Fair, she moved to Shoreline with her family. She was an elevator operator for Frederick and Nelson, a flight attendant for Northwest Airlines, and worked 30 years for Weisfield's Jewelers. Robert Joseph "Bob" Monks 1926-2018 Memorial service at St. Lukes for WWII army vet Bob Monks. Bob and his family lived in Shoreline for 30 years before building a house and moving to Poulsbo. After retiring as a civil engineer in 1987, Bob worked for the Edmonds school district and later volunteered with construction of the Poulsbo Library. Rory James Doyle worked in Shoreline for years, first at the Ryobi store and then at Sears. He loved old cars and owned over 50 in his lifetime. Doris L. Nelson 1929-2018 Services were held at the Berean Bible Church in Shoreline. Ronald (Randy) L. Wales Passed away unexpectedly at his parents' home in Shoreline. Arnold David Lind 1959-2018 David grew up in Shoreline and graduated from Shorewood high school. He played football at UPS on a four year scholarship and was the treasurer for Phi Delta Theta fraternity. He earned a Bachelor of Arts degree in 1982. 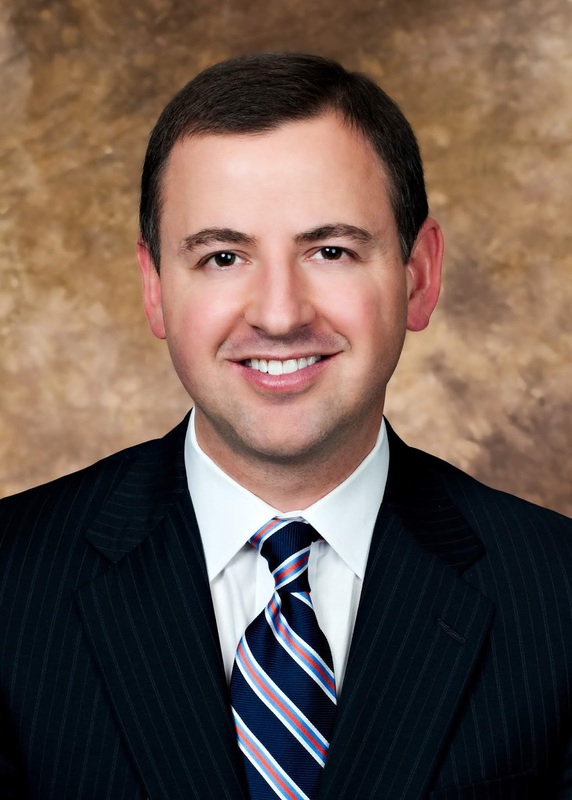 He was a national sales account executive for Navient and the son of Ronald Commissioner Arnie Lind. Jean Ferguson 1937-2018 Jean was a Shoreline resident who helped found a breakfast program that fed 300 people a week at her church in Seattle. As the wife and mother of an Air Force family, Jean’s travels took her across the country, where she lived in seven different states. She was a valued member of the Echo Lake Neighborhood Association in Shoreline (see obituary). Her celebration of life will be held Sunday, July 29 at 2pm at the Seattle First United Methodist Church. Dorothy Lane-Gilbert R.N. 1931-2018 In 1964 Dorothy and her family moved to Lake Forest Park where they eventually raised four children. She enjoyed gardening, especially roses. She also loved birds and raised roller canaries, a specialized song canary native to Germany. She had a 20 year nursing career, including Stevens Hospital, where she met her second husband. Earl Donnan 1929-2018 Memorial Service at Richmond Beach Congregational Church-UCC. Navy veteran and father of three was most proud of his six grandchildren. Dolores ("Dee") Faye Johnson 1930-2018 She taught high school in Kansas. She married in 1958 and she and her husband raised three children in Shoreline. Scott Albright Caldwell 1973-2018 Raised in Shoreline and Shoreline Schools, Scott was interested in the law and attended the para-legal program at Edmonds Community College. Scott loved to be in the mountains at night. "His car was his freedom. He and friends would get in his car and spend the night on remote logging roads and stargaze." His hobby was guns and he learned to shoot at a young age. Scott lived all of his life in a wheelchair, but his disability never defined him. Dorothy McGladrey 1918-2018 Her primary career was as a homemaker but she worked part time for Shoreline School district for many years. Mary Ellen Bumgarner Kerley 1917-2018 Lake Forest Park resident. Matriarch of a large and extended family. Services were held at Acacia in Lake Forest Park. William A. Eriksson, Jr. 1942-2018 Shoreline resident was an Army veteran who served in the Vietnam war. Services were held at St. Luke. Kevin C. Sill Shoreline resident died unexpectedly, leaving behind his wife Anina Coder Sill. Donations may be made in his memory to the Shoreline Historical Museum or KUOW. Gladys Charlotte Sorbo 1922 -2018 She and her husband moved to Shoreline in 2010 to live with family. Her husband died that year and she continued life in Shoreline. Colleen Kathryn Gauntt 1940-2018 Lake Forest Park resident died after a long battle with kidney disease. She told her family "not to feel sad because she felt she lived a full life and was blessed with so many wonderful people around her." Eric R. (Rick) Petersen age 59 1977 graduate of Shoreline High School died after a long struggle with multiple health problems. 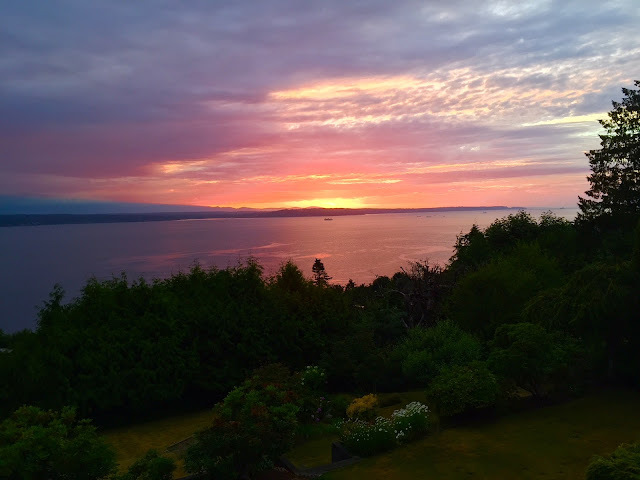 For the last week (except in the grey rain) we have had spectacular sunsets. It's time to get your coffee and head for RB Saltwater Park to the upper parking lot to watch the sun set. It's the best show in town. 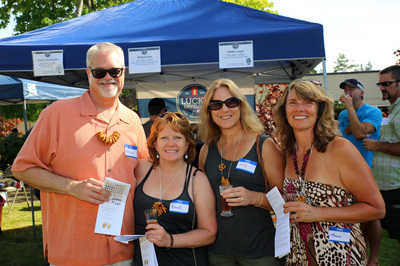 On Saturday, August 11, 4-Corners.Org will host the 8th annual BrewFest. If you've never experienced it before, make this your year! Here's what you need to know. It is a celebration of local brewers (around 20), combined with 4 hours of social adult time, accented by live music and underscored by great food. Saturday, August 11 from 3-7 pm. Any humans who are at least 21 years old. Yes, we will card everyone. Seriously. Advance tickets are $35. Designated drivers can get a $20 ticket, because how awesome are DDs? At the door, the price goes up to $40. EVERYTHING. 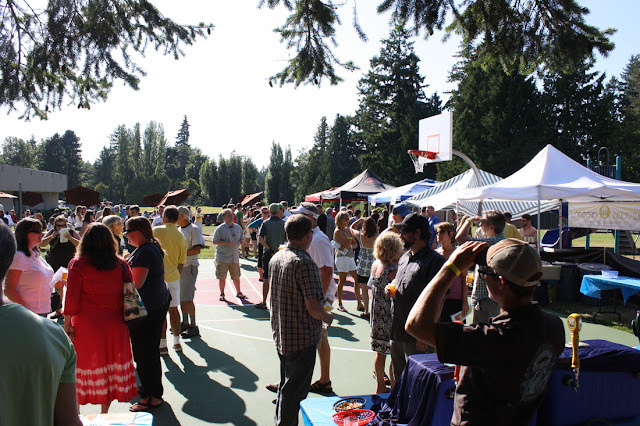 12 5-oz tastes of yummy local brews, grilled brats and pulled pork sandwiches, live music from Mosquito Fleet, non-alcoholic beverages, snacks, pretzel necklaces, and social time! DDs get all of that minus the alcohol. Well, yes. It's an inclusive ticket, so you don't have to buy dinner. And besides that, this is a fundraiser for the 4-Corners and a charity. This year, we're giving a portion of the proceeds to Forefront in Shoreline Schools – a 3-year suicide prevention program. I heard there's voting. What on earth for? We give trophies, and it's up to YOU to determine who goes home with what. 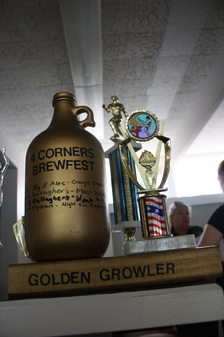 The biggest prize is the Golden Growler, which is awarded to the brewer who pours the top vote-getting brew. Check the website to see previous years' winners, participants, and photos. Online (a link will be up on the website shortly), or save the convenience fee and pay by cash or check at our local ticket outlet, Beach House Greetings (thanks Jenni!). Expect to be able to pick them up starting around July 4!! Many hands make light work, and we love volunteers! Join the crew and sign up here. I'd love to sponsor this. Fantastic! We are grateful for sponsorships! We can let everyone know how awesome you are via Facebook, Twitter, the website, and the Program. Send an email at 4cornersshoreline@gmail.com to connect with us! Find us on Facebook or check our website for updates on WHO's pouring and WHAT they're pouring! 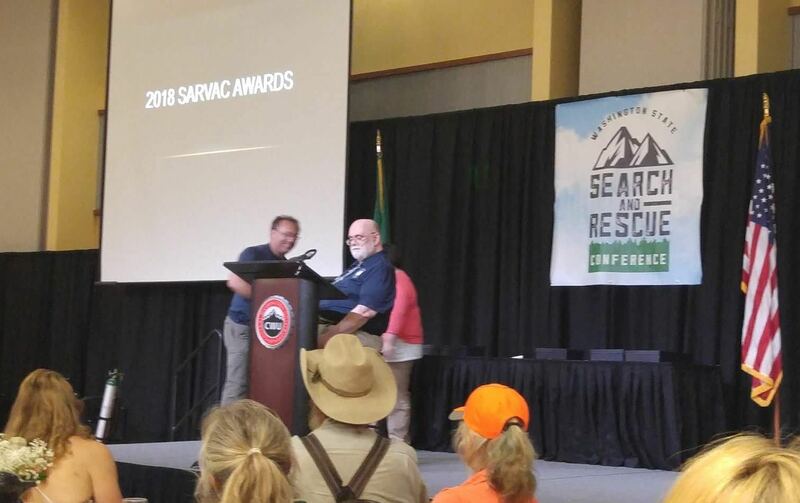 1992 Shorewood grad Chris Terpstra was honored with an Adult Leadership award for 2018 from the Washington State Search and Rescue Volunteer Advisory Council at its 50th Annual Washington State Search and Rescue Conference held June 18-24, 2018 in Ellensburg, Washington. Search and Rescue (SAR) units are volunteers whose mission is to search, rescue and / or recover those who become lost, missing, injured or killed while outdoors and to educate people on outdoor safety and wilderness recreation. 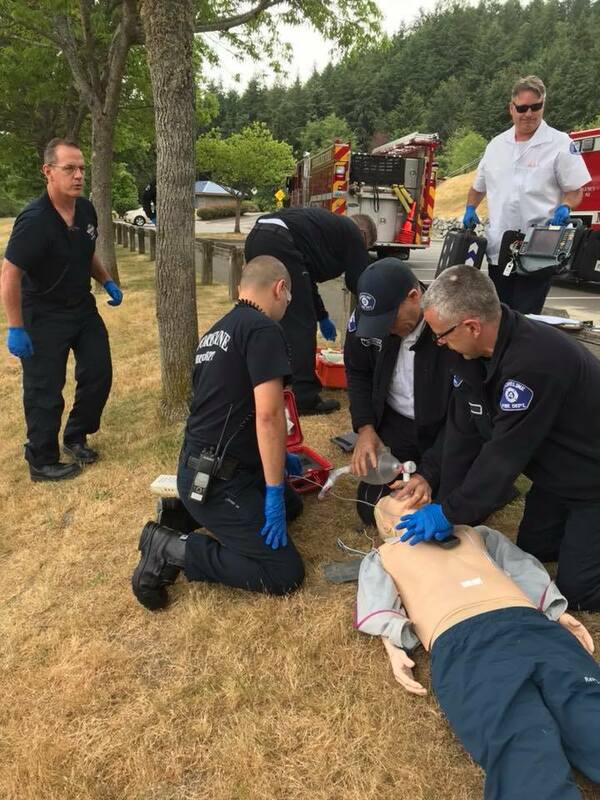 In 2017 there were 1,007 SAR missions in Washington State with 370 missions in King and Snohomish Counties. He is a member of the Snohomish County K-9 team, which nominated him for the award. Chris has been involved in search and rescue for over 14 years. He is an Operations Lead for the Snohomish County Volunteer Search and Rescue (SCVSAR) K9 Team and a member of Everett Mountain Rescue. As a member of SCVSAR K9 he has been a driving force behind many initiatives both inside the team and beyond in the K9 community at large. 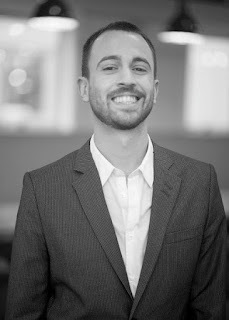 As a Microsoft employee, he is also applies his technical expertise to adopt and leverage new technology for the units. W. O. (Bill) Gillespie, President, Search and Rescue Volunteer Advisory Council, said that Chris has worked on a number of projects that have had impact all across the State of Washington. "He is an extremely valuable resource for us." Chris is currently working his second SAR dog Makalu, who is certified in Area Search and cross-training in cadaver, disaster, and avalanche. Chris has been on two hundred plus Search and Rescue missions in both urban and wilderness environment, including the 2014 Oso Landslide. In 2017, without K9, he deployed to Hurricane Maria (Texas) and Hurricane Irma (Puerto Rico). His nomination letter noted that "Chris is constantly looking to learn, improve, expand and share his knowledge and experience with his own team and others. 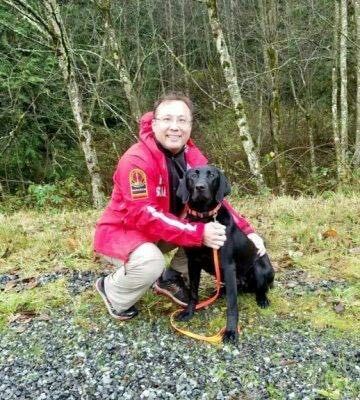 He has been instructing Area Search workshops to other teams in Washington State and is currently a Principal Area Evaluator with National Search Dog Allegiance (NSDA)." 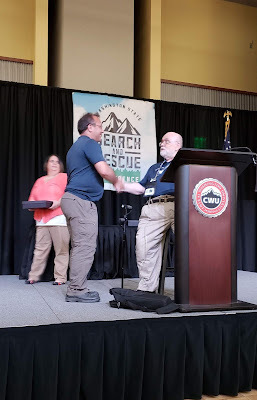 As for Chris, himself, he said "I am very honored by this award made only possible by continued support from family, teammates, friends, and the greater K9 SAR community. We are all volunteers working to help others." The accident was cleared to the side by the time I got this traffic camera shot. I drove by the scene going southbound on I-5 around 12:15pm on Wednesday. It looked like three cars collided just before the 195th pedestrian bridge. They were in the left lane on northbound I-5. A medic van and a Shoreline fire truck were on the scene and the occupants of some of the vehicles were standing on the freeway lanes. It didn't appear there were serious injuries. Neither Shoreline Fire or WSP commented on the accident - business as usual. The northbound traffic was backed up to 130th NE and more cars were getting caught in the back of the pack. Less than 30 minutes later the damaged cars were off to the side and the traffic, while thick, was flowing freely. Just another day on the the freeway. P.S. 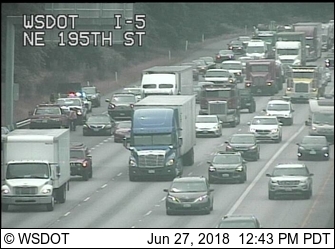 WSP did report on another accident on northbound I-5. Three car collision at N 117th at Northgate about a half hour before this one. 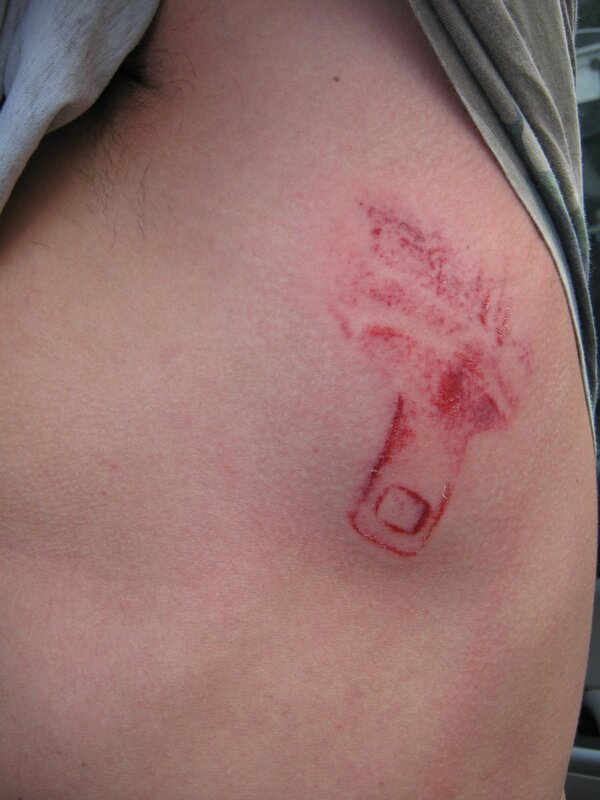 Washington State Patrol Trooper Brian Moore took this photo of a driver who was lucky to receive only minor injuries after being involved in a collision without wearing a seat belt. Here's proof it was hanging by his side! 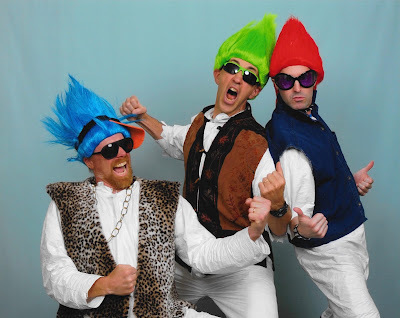 Seattle-based, children's music group will be performing a musical to educate children about prejudice, equality and compromise at the Richmond Beach Library on July 11th at 7pm. 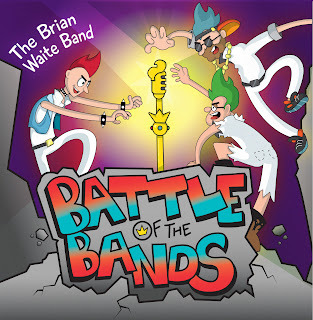 The 45 minute show is designed for 2-10 year olds and is called "Battle of the Bands". Battle of the Bands at the Richmond Beach Library 19601 21st Ave NW, Shoreline. FREE. The Brian Waite Band was born from the idea of creating live rock shows that thrill both parents and children alike. Founded in 2001 by Brian Waite (guitar), Todd Gray (drums) and Clif Swiggett (bass), the trio began touring the West Coast, and before they knew it, their music was being played all over the world. Seventeen years and eight critically acclaimed CD’s later, their interactive shows have evolved into more than just children’s concerts. The Brian Waite Band’s live shows combine musical theater, imaginative storytelling, laughs and a great rock ‘n roll concert filled with original songs that take the whole family on a “Rock ‘n Roll Adventure”. Two high school seniors from Shoreline are among 82 students throughout Washington who received scholarships for the 2018-19 school year as part of the Comcast Leaders and Achievers® Scholarship Program. Comcast held a recognition event for the students in Bellevue that included an advance screening of Jurassic World: Fallen Kingdom, before it hit the theaters. The program, funded by the Comcast Foundation, is a one-time, $1,000 scholarship awarded to the best and brightest high school seniors for their community service, academic performance and leadership skills. “These students from communities throughout Washington have accomplished some amazing things,” said Amy Lynch, Region Vice President, Comcast Washington. The Comcast Leaders and Achievers Scholarship Program provides scholarships to students who strive to achieve their full potential, who are catalysts for positive change in their communities, who are involved in their schools, and who serve as models for their fellow students. The philosophy behind the program is to give young people every opportunity to prepare for the future and to engage them in their communities. The program also demonstrates the importance of civic involvement, and the value placed on civic involvement by the business community. Visit here to learn more. Comcast Corporation (Nasdaq: CMCSA) is a global media and technology company with two primary businesses, Comcast Cable and NBCUniversal. www.comcastcorporation.com for more information. Comcast Foundation was founded by Comcast Corporation in June 1999 to provide charitable support to qualified non-profit organizations. This giant, fluffy cloud dominated the afternoon sky over Shoreline. It seemed much lower and actually more dramatic when I saw it near Shoreline Community College. It was nice to see a white cloud instead of grey - and it's the biggest single cloud I've seen in a very long time (clouds that fill the entire sky don't count). Fun to see light and colors instead of our usual dark and grey. The Lake Forest Park (LFP) Municipal Code that allows conservation cluster housing as a conditional use has been repealed by the passing of Ordinance 1179 at the Council meeting on June 14. 2018. City Administrator Phillip Hill stated that the residents could expect a city-wide housing study in the spring of 2019. This will also involve the residents in a public process to determine if cluster housing works in LFP, and if it does, how should the City implement it? A new beginning is being asked of the City Council and asked of the residents, too. 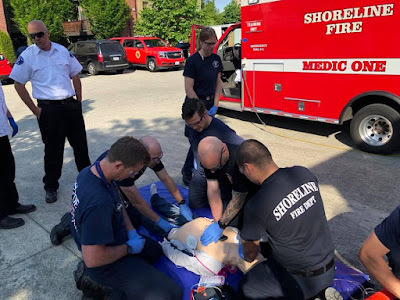 “This is a no name and no blame situation and let’s move forward,” commented Deputy Mayor Catherine Stanford at the June 14th Council meeting. The City is faced with a mountain of work (Big Five City Projects) that represent the biggest changes in LFP history. 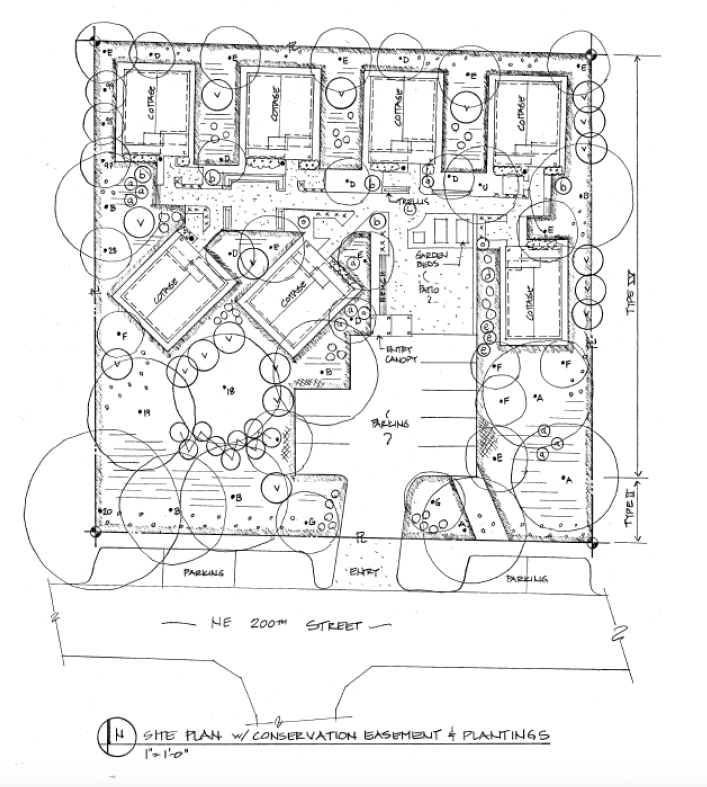 Conservation cluster housing ideas grew from the various stages of Town Center growth and planning considerations. Without the proper process for citizen input and education, the ordinance became misunderstood, and resentments and tempers flared. When something happens “out of order” residents can become concerned and sometimes angry. Vice-Chair and Councilmember Tom French asked for the personal attacks on social media to stop. He said, “We are better than this as a community.” Other Councilmembers also stated at the June 14th meeting that what has taken place has been hurtful and not very civil. The subject of a significant change in land use requires a community-wide discussion, and citizens feel this did not happen. It did appear on the Council’s agenda eighteen times, however, it was listed under the critical areas discussion and the wording of conservation cluster housing appeared only once, so it seemed buried in the agendas due to semantics. Citizens throughout the City appeared in various Council Chamber meetings including three former LFP City Councilmembers, Don Fiene, Jack Tonkin and Ned Lawson. These three LFP former Councilmembers believe that protecting the ecosystem and saving green space by encouraging higher density doesn’t equal out to them. Various trends in Washington are seeing some cities halting development to manage growth. These cities are making sure that regulatory infrastructures are both feasible and in place and to take the time to assess whether future development matches a community’s history and its vision. There is also a trend to build larger homes as more families expect to house their elderly parents, and some children are living at home longer due to various social and economic factors. Lake Forest Park residents are known for resisting attempts for population or economic growth. Many multi-generational residents enjoy living in nature and gardening in a forest-like atmosphere. Since the original and unique platting of the LFP land in 1912 residents have been committed to maintaining and to grow the ecosystem through various preservation efforts. The huge growth in the region threatens LFP’s history of a low-density residential neighborhood, and residents wonder about not only losing the surrounding nature and trees, but are concerned about the overall quality of life with increasing air and noise pollution and safety issues on the rise. 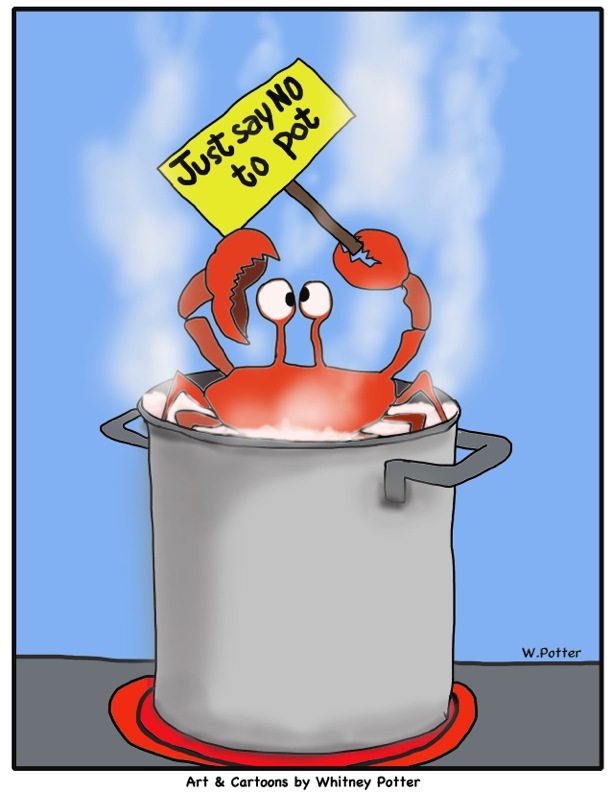 Remember that all seven LFP Councilmembers have stated in previous public meetings, and all have voted, that they believe conservation cluster housing is a good housing alternative going forward, and that is how the City got to this place. Larger square footage homes have been viewed as a concern by City Council as the City’s open green space is suddenly being absorbed at higher rates. According to many architects and builders, these larger homes tend to require the use of more impervious surfaces. Conservation cluster housing reduces the sizes of individual houses but requires that a larger quantity of smaller homes be built on the site. A permanent “forested” easement is created to conserve 50% of the properties land. Housing prices continue to climb in the entire region as well as the cost of labor and materials for building. If a good stock of housing is not available, all property values continue to increase along with property taxes. Lake Forest Councilmembers are also hearing from residents that do support added density and are willing to examine cluster housing as an alternative housing option; there is already some resident support of the concept. City Council members have previously stated that their primary and collective goals for cluster housing are to encourage greater environmental conservation when a property is being developed. Other intentions are housing options for LFP seniors who want to transition to smaller homes yet remain in LFP, and as a means for a younger population to gain entry into the housing market. No matter what housing alternatives the residents finally accept, population growth will continue in the Seattle “Emerald City” and beyond. For an in-depth discussion of what happened during the conservation housing quorum vote - that was considered invalid because it did not have the four votes that are required by Washington State law- and other info about past RCW’s and their passage, view the June 14th City Council regular meeting available on the website. Deputy Mayor Catherine Stanford provides a detailed account at (00: 21:37). It’s about 5 minutes in viewing length. If you want your voice heard, be aware of those upcoming City outreach meetings in spring of 2019. This is when the subject of cluster housing is scheduled to return on the Council and the Planning Commission agendas again. Donna Hawkey is a LFP resident for almost 22 years. She can be reached at dhawkey@comcast.net. Mike Dee from the LFP Citizens’ Commission provided editorial input. In 2017, the King County Board of Health took steps to inform visitors to Crisis Pregnancy Centers (“CPCs”) about the limited nature of the services the centers offer and provide. “Today’s Supreme Court ruling is an unfortunate step backward for women’s reproductive health care in America. Limiting information and enabling misleading practices in the reproductive health field puts women at risk. “When I authored King County’s crisis pregnancy centers notice requirements, I worked with our legal team to carefully tailor our regulation to ensure compliance with the Constitution. We paid close attention to the California law and the legal challenges to it and similar laws around the country. We intentionally crafted King County’s rule to be less broad than the California FACT Act disclosure requirements, while still ensuring that women who are or may be pregnant understand that limited service pregnancy centers are not health care facilities. “The Supreme Court made clear in their decision today that they “express[ed] no view on the legality of a similar disclosure requirement that is better supported or less burdensome.” NIFLA v. Becerra at 20. "King County’s Rule and Regulation is both better supported and less burdensome. It was based on a strong and extensive factual record showing the confusing practices and adverse impacts to women in King County. The Board of Health adopted strong and detailed findings to support the rule after hearing extensive oral and written testimony. In addition, our rule is less burdensome than the California rule struck down by the Court today. “I am reviewing the Court’s decision with our legal team. If we need to fine tune the particulars of the form of the disclosure, we will do so. Regardless, I am optimistic that the County’s more narrow regulation that was supported with a strong factual record is constitutional and will remain in place.